An owl, the moon, an ""eldritch light""--such are the images that Koontz plants throughout his latest novel to stress the bond between his narrator, Christopher Snow, and the night world that Snow must embrace. Snow suffers from xeroderma pigmentosum, a rare skin disorder that hampers cell repair from sun damage. Few who have it survive as long as the 28 years Snow has endured. Two years earlier, his mother died. Now his father has passed away from cancer, leaving him with the enigmatic directive: ""Fear nothing."" Snow and his dog, Orson, join forces with his surfer pal, Bobby Halloway, to solve the mystery of what happened to Snow's father's corpse, which has vanished, and of why his father's nurse, Angela Ferryman, was murdered after babbling about rhesus monkeys and a clandestine experiment that involved his mother. Snow soon discovers unusual intelligence in the local animals, encounters further riddles from an eccentric ""animal communicator"" and comes to realize that he can trust only his closest friends as he investigates past activities inside a nearby abandoned military base. As usual, Koontz presents a unique fictional world grounded in convincing detail; even the surf-lingo banter between the main characters plays its part, adding an ironic note that heightens tension. 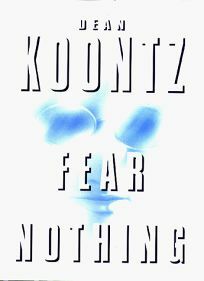 This is only the second book Koontz has written from a first-person point of view, and the ploy works well: readers will be riveted to the narrative as Snow anticipates a genetically engineered Armageddon. Koontz's familiar theme of life's victims defying the odds emerges here as forcefully as it does in Sole Survivor and Intensity, but Snow's physical limitation gives it a more dangerous and intriguing edge. BDD audio. (Jan.) FYI: While not releasing specific figures on the first printing or the promotional budget, Bantam is saying that Fear Nothing will be backed by ""the largest Dean Koontz Consumer Marketing Campaign Ever.""